In-chat assistance is not a new concept. If you've ever used Google's Allo app, you'll know what it's all about. While in a conversation with a friend, you can call upon the Google Assistant to answer a question, bring up directions, or perform a host of other helpful tasks, all without leaving the conversation. 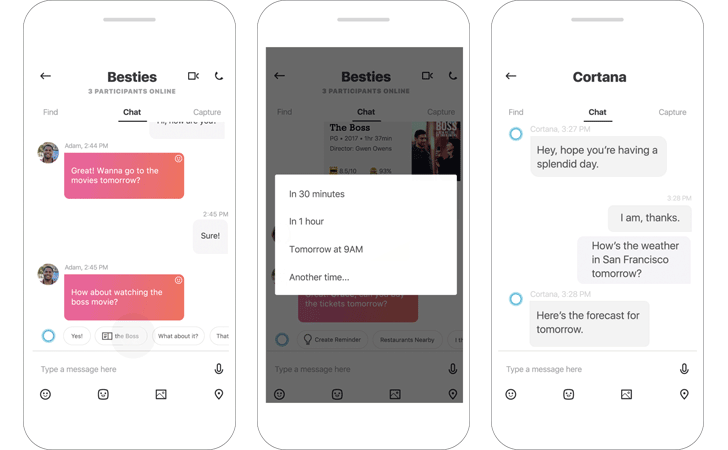 Skype will soon be getting similar functionality, as Microsoft is bringing its Cortana assistant to the messaging app. As well as being able to bring up web results, you'll be able to utilize Cortana's full range of abilities. These include creating reminders and scheduling calendar events. Cortana will automatically detect when you're talking about something it can help with, and contextual options will be offered just above the chat box next to the blue ring. Cortana will work just as well in a one-on-one chat as it will in threads with large groups of friends, and if you'd just like to chat to Cortana directly, it will also have its own contact in Skype. Smart replies, much like those that pop up in Allo, are also available courtesy of Cortana, which could save you the odd second here and there. The gradual rollout of Cortana to the Android and iOS Skype apps starts today, though it appears it will be US only for the time being. There's no word about Cortana coming to the desktop version of Skype, but I wouldn't rule it out. For more information, there's an FAQ page, and you can leave feedback about the feature on the community page. I'm sure this will once again raise questions about privacy, as Cortana will be scanning every message you send on Skype. Let us know what you make of it all in the comments. Update: A new version hit APKMirror today, but Corbin has checked it out and Cortana wasn't there for him. Enabling Cortana might involve a separate server-side switch. Let us know in the comments if any of you have it yet.